Perhaps unsurprisingly, a dental kit is not at the top of many people’s packing list for their bug out bag. However, if you are planning to live the survival lifestyle for months on end, you cannot realistically expect the dentistry profession to continue when the rest of society has scaled back. You, of course, can prevent most dental problems by packing a supply of toothbrushes and toothpaste. You may find yourself in a position, however, where you cannot get enough calcium or someone else in your party suffers a toothache and you will need to perform field dentistry. Temporary fillings - One of the most common dental accidents that happen are lost or broken fillings. Fillings cover cavities in your teeth, so it can be absolute agony if one falls out or becomes cracked. Your dental kit needs some temporary fillings as well as dental filler, which looks and feels like wall filler. You simply clear the cavity using a toothpick, fill it with dental filler and then bite down on the filling. It will hold for around a month, which hopefully, will be enough time for you to find someone with some professional dentistry skills. Dental filler – Using something like Dentemp will act as a base for most of the temporary filling or crown fixings that you will perform. It comes as a paste and it is always best to use more to ensure a good bond and scrape off the excess afterwards. Denture repair kit – It is likely that if you are planning to survive with family, you will have someone in your group who uses dentures. Without teeth or false teeth, eating can be almost impossible which will put their health at risk. A denture repair kit should include denture repair powder and liquid. These combine to make a strong paste that will repair their dentures with the same strength as a tube of denture paste. Again, this will be a temporary measure but you can mix up a new set of the mixture when the old stuff loses its adhesiveness. Toothache drops – Simple toothaches often present themselves as a persistent pain and because your jaw is so close to your brain, it can sometimes feel like the start of a migraine. Basic painkillers may not target your teeth directly while toothache drops will get to the pain straight away. Having a dental kit is fine as you will be well prepared with the right equipment, but you will be at a loss unless you have a basic understanding of how human teeth work and how to repair them. Make sure that when you are looking for how-to books that you find ones that will work without mainstream dentistry equipment. 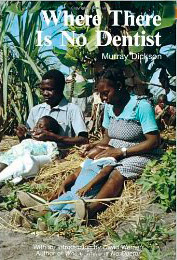 The best book on the market at the moment is called Where There Is No Dentist. When you are packing your food, for example, you should avoid highly acidic food such as apples and spicy meats, which will erode your tooth enamel. You also avoid stocking up on whitening and tartar control toothpastes as these also make your teeth more sensitive. Sensitive teeth will make it harder to drink cold water or deal with cold weather, both of which will stop you from performing well in survival scenarios. While it will be important to have a dental kit stashed in your bug out bags along with your survival dentistry, you and your family should practice preventative dental care. Combining good dental health habits with nutritious food, you might minimize your need for the higher-level dental care.